Update 4, 9/1: Here’s a large image of the flyer so you can print it out, courtesy of Chris. If anyone is able to create an even bigger version, please send our way and I’ll post. Update 2: Jeff’s wife left a comment with an update on the car in the park. Update 1:According to commenter mb, Jeff’s truck was found in Carkeek Park (950 NW Carkeek Park Rd) on Sunday 8/28 but Jeff is still missing. At 6′ 2″, 200 pounds,a walrus mustache, and friendly as the day is long, Jeff is hard to miss. 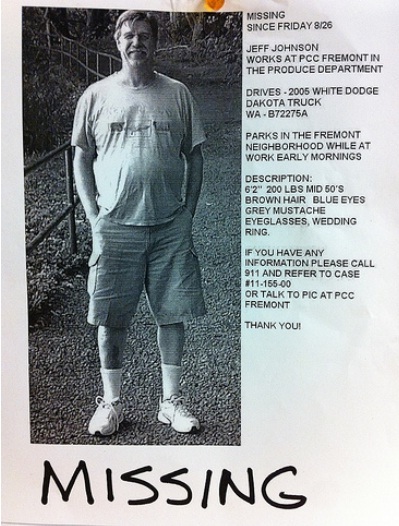 The flyer has details about his truck including the license plate number. I think it said he was in his fifties. He usually parks his white pickup in the Fremont neighborhood while working at the store. He has worked for PCC for quite a while. 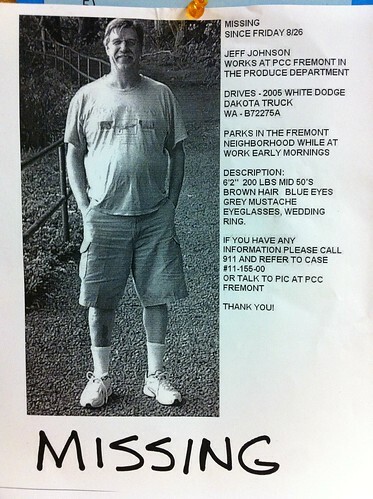 Anyone having info can contact Fremont PCC or other number on the flyer. Everyone hopes he is okay. We’ll keep you updated, let us know if you hear any developments as well. Fremont retailers Bitters Co. and Hub and Bespoke will co-host a parking spot on Evanston at N 36th Street. The spot will feature furniture, carpets, and other creature comforts from Bitters Co., while Hub and Bespoke will serve up fruit slushies blended using pedal power. PARK(ing) Day 2010 included more than 800 “PARK” installations in more than 180 cities in 30 countries on six continents. More information regarding local PARK(ing) Day activities can be found at feetfirst.info/events/park-ing-day and a global map of all participating cities are available on the PARK(ing) Day website, at parkingday.org. The first multi-performance production in Fremont’s newest theater venue, West of Lenin, arrives in Seattle this week. Digital artist J-Walt brings his newest Spontaneous Fantasia show, The Omnicentric Universe, to West of Lenin for four performances – Wed 8/31 at 8pm, Fri 9/2 at 8pm and Sat 9/3 at 5pm and 8pm. In Spontaneous Fantasia, J-Walt utilizes the latest in interactive computer graphics techniques to bring paintings to life. The result is a live animated movie that unfolds before an audience. These works incorporate elements of animation, theater, dance, painting, sculpture, music, architecture, and interactive art. Check out a preview of the show below and head over to Brown Paper Tickets to purchase tickets. Seattle garbage, food and yard waste and recycling collections will be on normal schedule for Labor Day, Monday, Sept. 5. Seattle Public Utilities customers should place their containers out for collection by 7 a.m. to ensure collection. The City of Seattle’s North & South Recycling and Disposal stations will be open during their regular business hours: 8:00 a.m. to 5:30 p.m. The North Recycling and Disposal Station is located at 1350 N. 34th St. in the Fremont/Wallingford area. Customers can report a missed garbage, yard waste or recycling collection after 6 p.m. on the day it was missed by visiting the On-line Missed Collection form available on SPU’s web site, at: www.seattle.gov/util/Services/Garbage, or by calling 206-684-3000 then next business day. It’s that time again. The Fremont First Friday Artwalk is here once more and takes place this Friday, September 2nd. The Academy of Awesome Mobile Tour debuted on June 25, 2011 with a kick off party in Los Angeles, Calif. The giant blue Winnebago, covered in the signature Paul Frank monkey face logo (known to fans as “Julius”), has made its way East across the Southern portion of the United States and will be coming back through the Northern Route. Tour stops will showcase a retrospective exhibit displaying limited edition co-branded products dating back over a decade. Other activities include a Creation Station where aspiring designers of all ages can submit art for the chance to create an exclusive Paul Frank t-shirt sold at Paulfrank.com, a battle of the bands, silk screening, ping-pong, a “puppy prom” inspired fashion show and so much more. The Winnebago will feature a product showroom and lounge showcasing Paul Frank’s latest collection. The newly equipped Winnebago also features interactive stations for social media and music all driven by custom designed furniture incorporating the ipad. 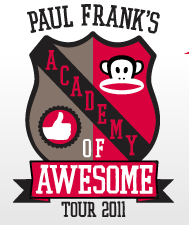 For more information on the Paul Frank Academy of Awesome Mobile Tour 2011 visit www.academyofawesometour.com. Check out the full list of artists, venues and events here and enjoy the artwalk! The 2011 Small and Simple Projects Fund, a program of the Neighborhood Matching Fund, will be open for applications beginning on Thursday, September 1 for the fall cycle. The fund is open to all eligible applicants and project types. In recognition of Emergency Preparedness Month this September, Seattle Department of Neighborhoods (DON) and Seattle Office of Emergency Management (OEM) encourage community members to apply for funding to help them organize and engage their neighbors and plan for emergency and disaster situations. The deadline for the Small and Simple Projects Fund for awards up to $20,000 is Monday, October 17 by 5 p.m. Community members can also apply to the Small Sparks Fund for awards up to $1000 with applications accepted year-round. To learn more, visit www.seattle.gov/neighborhoods/nmf/. Two workshops have been scheduled for community members to learn more about the NMF program and emergency preparedness project ideas. The workshops will be held from 6:00 – 8:00 p.m. on Tuesday, Sept. 13 at the Ballard Public Library (5614 22nd Ave NW); and on Thursday, Sept. 15 at The 2100 Building (2100 24th Ave S). All applicants are strongly encouraged to attend a workshop. Community members are also encouraged to contact a Neighborhood Matching Fund Project Manager before applying at 206-233-0093 or NMFund@seattle.gov. For those applying for emergency preparedness projects, contact the Seattle Office for Emergency Management at SNAP@seattle.gov or call 206-233-5076. The Fremont Arts Council and the Fremont Neighborhood Council have partnered to keep ahead of the taggers and keep the Bridge Way Mural clean. But they need your help. They will be out on Saturdays, August 27, September 10 & September 24. There will also be a special paint-out on Friday September 16, for the United Way’s Day of Caring, The Fremont Arts Council will have groups working at the Troll, the Mural and the Powerhouse. To get involved with the painting party, contact FAC Board President, Michael Clark, at clark27mw@gmail.com. This weekend, it’s time to get your love-on, Fremont. The two-day music festival Northwest LoveFest takes place this Saturday and Sunday. The festival was born from the belief that music festivals should have a positive effect on humanity and the environment we all share. The 2nd annual Northwest LoveFest will once again bring the community together to celebrate and support various nonprofits, vendors, artists and musicians who embody their message. LoveFest providing free water, offsetting carbon with TerraPass and donating 1% of revenue to protecting Earth through 1% for the Planet. Since the festival borders the Burke-Gilman Trail, LoveFest, with the assistance of Bike Works, is providing free bike parking within the festival grounds; bring a lock for security. Purified water is brought to LoveFest courtesy of Clean Water Foundation and Seattle University’s Engineers Without Borders so bring a drinking vessel for free water or buy a compostable cup for $1. This year, within our Liquid Libation Lounge, the festival will feature Full Sail Brewing.They will have their IPA, Pale Ale, Amber and their LTD 03, which is a crisp Pilsner-Style lager, on tap. They’ll also be featuring the best Hedges Family Estates wine. The official LoveFest Afterparty will be at the Nectar Lounge, August 27th, 11 PM – 2 AM. Entry is free with LoveFest wristband, $5 without. Featuring Elemental Zazen, ASUN AKA Suntonio Bandanaz and Sunz of Sound. Click here to learn more. Purchase tickets for LoveFest at Brown Paper Tickets. Seattle Mariners pitcher and reigning American League Cy Young winner, Felix Hernandez, will make an appearance in Ballard on Thursday. Hernandez will be signing autographs and posing for pictures at the Ballard Fred Meyer ( 915 NW 45th St) from 1:45 to 3 p.m. The event is sponsored by Pepsi MAX Field of Dreams promotion. Pepsi MAX Field of Dreams is a joint promotion with Major League Baseball. Fans can vote online for their fantasy team of the greatest players of all time at each position. The winner will be announced during the MLB postseason. The prize is the chance for a team of MLB legends to play ball against the lucky winner and 10 friends.